Oregon wine producer Union Wine Co., founded by winemaker Ryan Harms, launched Underwood Pinot Noir and Pinot Gris in 375 ml cans (equivalent to about a half bottle of wine) in mid-2014. The wines are the first non carbonated wines to be bottled in a can. A canned rosé is planned for early 2015. Why in the world would you want to bottle Pinot Noir, the Queen of Wines, in the lowly flip-top beer can? Union Wine Co. had two goals. First the can eliminates the pretentiousness associated with wine drinking, a philosophy with the tag, “#Pinkies Down,” displayed on the back of every can to urge drinkers to stop drinking wine with pinkies in the air. Second, the aim is to make wine more accessible. When you think about it, packaging wine in a can is not a crazy idea. Cans are very practical as they are portable and readily disposable. You don’t even need a wine stem. Now you can take a four-pack of Pinot Noir on your next hiking or camping trip. The cans are much lighter than bottles, easy to transport, unbreakable, and reduce the environmental footprint because they are recyclable. Since the can, manufactured by Bell, is lined, there is no unwelcome flavors and testers have verified that the wine tastes identical to the same wine packaged in a traditional 750 ml bottle. The public’s response has been very positive, with about 7,000 cases of wine canned this year and everything sold or pre-sold. The canned wines are widely distributed and can also be bought online at www.unionwinecompany.com. A four-pack of Pinot Noir is $24.99. Union Wine Co. produced about 110, 000 cases of wine in 2013, including the winery’s own brands of Kings Ridge, Alchemist and Underwood, as well as other brands at its winery facility in an industrial complex in Tualatin. Coinciding with the International Pinot Noir Celebration this year held in August, Union Wine Co. rolled out a new mobile wine tasting truck on the streets of downtown Portland where food carts are a way of life for the community. 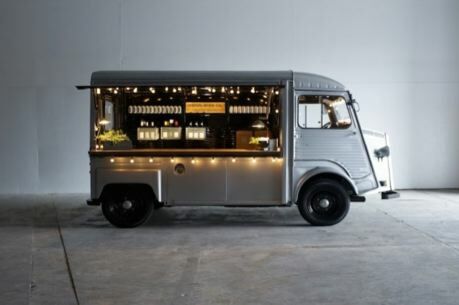 The innovative Harms repurposed a vintage 1972 Citroën H Van. 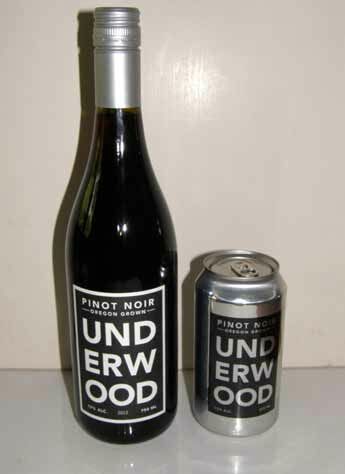 I recently tasted the Underwood Pinot Noir and Pinot Gris from a 375 ml can (no vintage is stated on the can but I assume it is 2013 from press reports), and the 2013 Underwood Pinot Noir from a 750 ml bottle. Union Wine Co. states that the Pinot Noir is identical and tastes the same, but I did not find that to be the case. I also preferred the Pinot Gris over the Pinot Noir from a can.